The Toronto Gaels will be starting Winter training with 12 weeks of indoor football beginning on Jan 12th, 2019. Location will be Soccer World Polson Pier on Cherry St., in the Port Lands. Due to high demand this year, we have booked two weekly time-slots for our current club members to play Indoor Football. 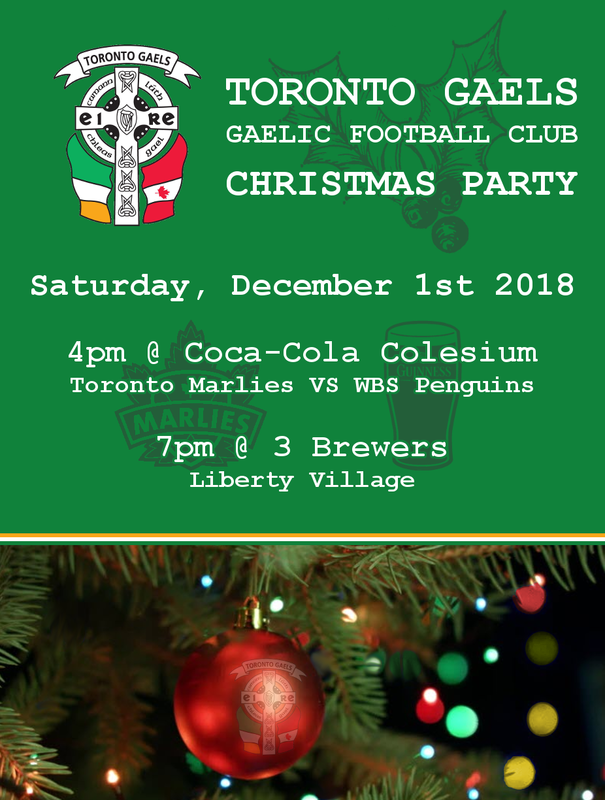 Looking forward to our Christmas Party this coming Saturday, December 1st. We’ll be starting off with a Toronto Marlies Game at 4pm in Coca-Cola Coliseum. Once the game wraps up we’ll be heading over to the 3 Brewers in Liberty Village at 7pm to ring in the season. All are welcome!! If you would like to come along, get in touch with us! Big shout out to veteran Gaels player, and 2019 Committee member Enda McHugh (a.k.a. Badger) for organizing his annual November trip down to Buffalo to see the Bills play! Enda has made this a firm fixture in the club social calendar, and it is always a serious craic weekend away!! 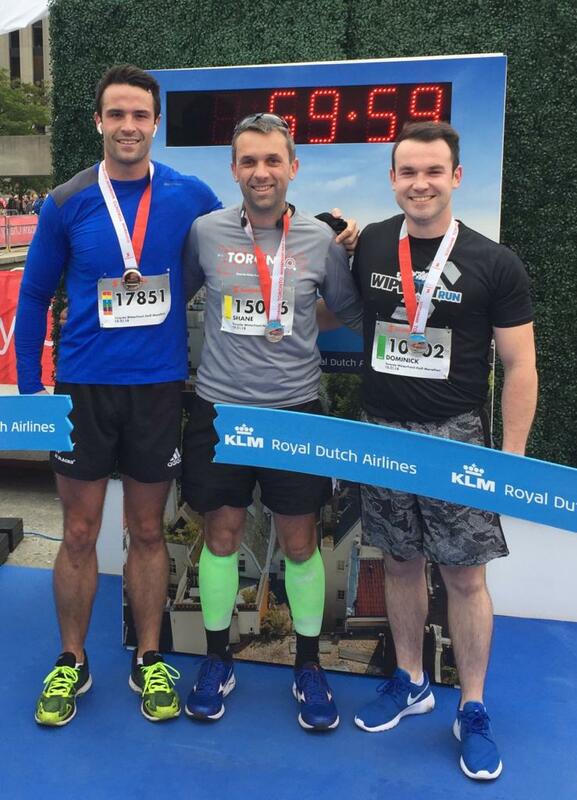 Well done to the Gaels lads who completed the Scotiabank Half Marathon this past Sunday. Gavin Blower, Shane Watters, and Dominick Keaney are pictured below, looking fresh enough to do it all over again!! Toronto Gaels are hosting our 5th Annual Race Night on Saturday, May 5th at The Galway Arms, 838 The Queensway, Etobicoke. We invite all club members and friends to join us for what is expected to be a great night's entertainment. First race on the night will be at 6:00pm. If you are a club member and would like a Race Card to sell horses on behalf of the club you can download it here and print a copy. All Race Cards should be returned to a member of the committee by May 1st at the latest. 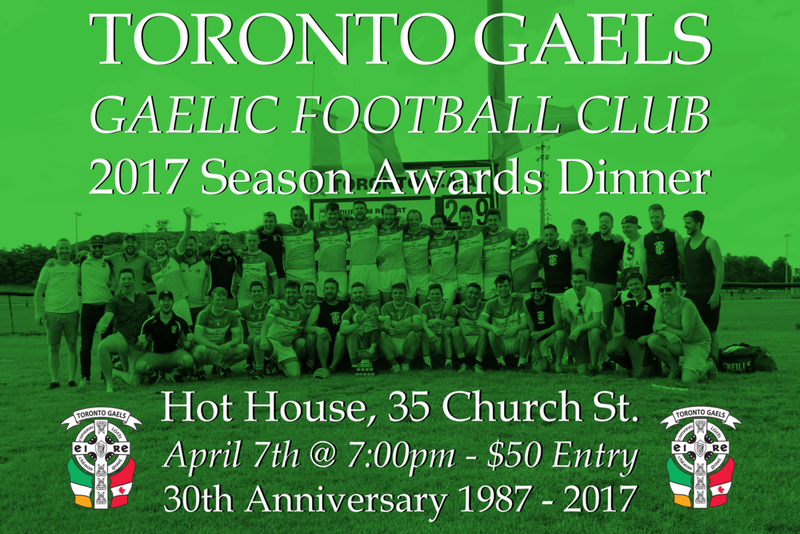 Join us at our Toronto Gaels 2017 Season Awards Dinner to celebrate our club's 30th anniversary season (1987-2017), on Saturday, April 7th at 7pm, in The Hot House Restaurant, 35 Church St.
Tickets are $50 and include a three course meal, and wine. For ticket purchase, email 'torontogaels@gmail.com'. We look forward to celebrating a strong 2017 season, with competition wins and silverware on the books for both our Senior & Intermediate teams. Great times had up north at Innisfil for Toronto Gaels annual Ice Fishing trip this past weekend. 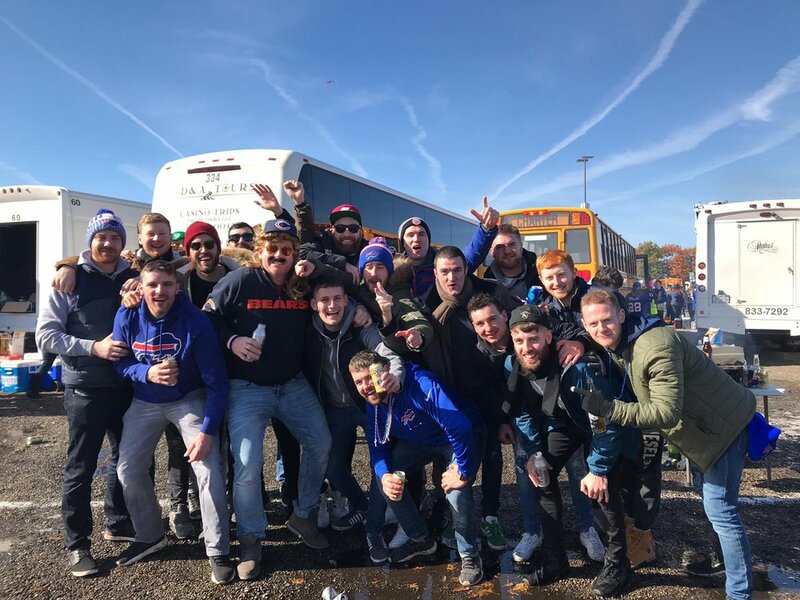 Massive thanks to Morgan Hynes (Gootch) for organizing the weekend, and to all of the lads who came along and made it serious craic! Weekly Indoor pre-season conditioning training begins February 20th at UofT Athletic Centre at 55 Harbord St.
Meet beside the turnstiles in main lobby 15 minutes sharp before start time (see schedule below). All are welcome! Well done to everyone involved in the Toronto GAA on hosting a fantastic awards event this past Saturday night at the King's Garden Banquet Hall!! We were proud to see long time Gaels man Eamonn Gallagher receiving the Toronto GAA Person of the Year award. Our own Gerry Smith picked up the well deserved Intermediate Men's Football Player of the year award. Visit our Gallery for more photos of the night. The Toronto Gaels will be starting Winter training with 12 weeks of indoor football beginning on Jan 13th, 2018. Location will be Soccer World Polson Pier on Cherry St. down beside the Docks. We have booked a weekly time-slot for our current club members to play Indoor Football. Come and join us to help ring in the Christmas season. Bring your friends, family or S.O.'s. All are welcome!! The theme for the night will be a Charity Shop Dress-up. There will be a prize for best dressed. This is a great opportunity to give back to local charities, as we celebrate the giving season, while enjoying a few pints at the same time!! Thanks to everyone who attended our AGM last night, and congrats to the new commitee. Welcome especially to the new lads coming on board! We're looking forward to getting stuck in to preparing for next season. Gaels Abu! We're famous! 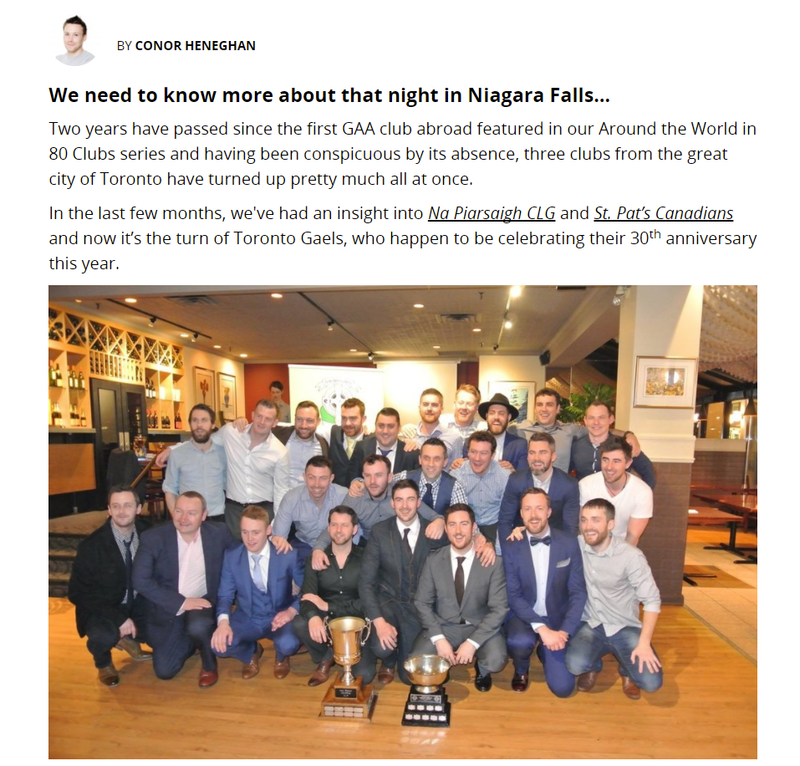 Toronto Gaels are honoured to be featured on JOE.ie in their "Around the World in 80 Clubs" segment. 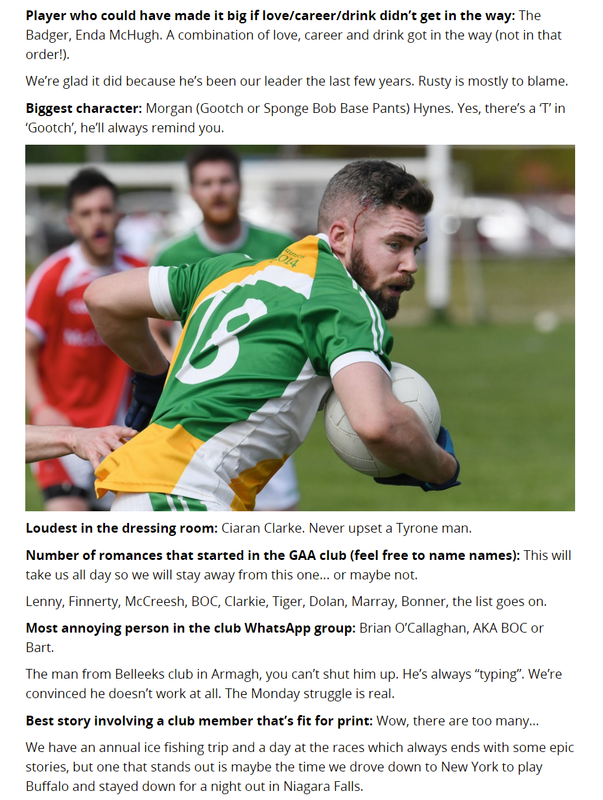 Great work from club Chairman Shane Watters, who sent this in with all the banter. Check out this link for the full article on www.joe.ie, or take a look below.